To order this book, call Taylor Publishing Co. at 1-800-275-8188. "It is a marvelous guidebook for the beginner. What makes it so useful, however, is its value even for veteran visitors to battlefields. The certain success of this volume will surely generate a demand for a second one covering other campaigns. I envy those of you who will be touring Civil War battlefields for the first or second times with this volume in hand. A whole new and exciting world awaits you." from the foreword by James M. McPherson, Pulitzer prize-winning historian, George Henry Davis Professor of history, Princeton University, and author of Battle Cry of Freedom and numerous other works. "This is a remarkably useful guide to some two dozen of the most important Civil War battlefields. In admirably compact form, Eicher has provided a storehouse of information that will make this a perfect companion for first-time visitors as well as those who have been to the battlefields before. I recommend it highly to anyone who hopes to make the most of their visit to these famous historic sites." Gary W. Gallagher, chairman, Dept. of History, Pennsylvania State University, author and editor of many works, including Stephen Dodson Ramseur: Lee's Gallant General and The Third Day at Gettysburg and Beyond. "On many now-placid fields, thousands of young men died in the great battles of the Civil War. Visiting these battlefields can bring a mystic communion with the past, if enhanced by the knowledge of the events and the terrain. Travel with Eicher's guide gives every visitor the companionship of an expert who can make fields and monuments speak about the glories and horrors of the conflict. No previous guidebook has explained the battlefields so clearly, concisely, and helpfully. Eicher escorts tourists along the highways of modern America into the reality of the Civil War." John Y. Simon, Dept. of History, Southern Illinois University, editor of The Papers of U.S. Grant and other works. Gettysburg, Pennsylvania (pop. 7,025), is the king of Civil War sites. Although in recent years the town has been commercialized, the thousands of acres within Gettysburg and in the fields north and south of town comprise the largest and most well marked Civil War site you can visit. The business of memorializing the battle of Gettysburg began a few months after the event, when Abraham Lincoln traveled to sleepy, shellshocked Gettysburg and delivered his great address. Like Chickamauga and Vicksburg, the serious effort to memorialize what occurred in the park developed in the 1890s. Today many significant structures stand on the Gettysburg battlefield, both in and out of the park boundaries, and more than 2,000 monuments, tablets, and markers highlight important actions during the momentous three day struggle. As my father and I drove east on US 30 from Chambersburg, the anticipation of again seeing Gettysburg was exhilarating. Having been to the battlefield many times, the size and scope of things to see nonetheless always allows something new to crop up in a visit to the hallowed ground. We traveled through Cashtown and approached the battlefield, retracing the route of thousands of Confederate soldiers who marched toward the town. Gettysburg can be reached not only from Chambersburg, however, but also from Harrisburg, Pennsylvania, to the north; York, Pennsylvania, to the east; Frederick, Maryland, to the south; and Hagerstown, Maryland, to the southwest. Our target was the Gettysburg National Military Park, whose Visitor Center is located just south of town on the Taneytown Road. Gettysburg is universally recognized as the great and decisive battle of the Civil War. Yet it occurred, as did the siege and fall of Vicksburg, midway through the war. Gettysburg signaled at once the high point of the Confederacy, which would slide into oblivion over the following 22 months, and the beginning of a vision of eventual Union military victory. The three day battle of Gettysburg took place on July 1, 2, and 3, 1863, the result of Gen. Robert E. Lee's second invasion of the North. Lee's movement, really a gigantic raid, followed the battle of Chancellorsville in May 1863. The decisive Confederate victory emboldened Lee to strike north to gain the initiative from the Yankees, draw the war away from Virginia, perhaps gain recognition from Britain or France, and certainly to draw Grant away from his strangle hold on Vicksburg in the west. Lee moved north on June 9 and by the end of the month the Federals, under Maj. Gen. George Gordon Meade, pursued. By happenstance, the armies converged on the railroad center of Gettysburg, where Confederate troops ran into Union cavalry. The battle of Gettysburg, originally an accident, spun rapidly out of control as more and more units were pushed in from each side. Lee engaged some 75,000 men versus Meade's 88,289. The battle was really three battles, the first day's fight north and west of the town, and through the town; the decisive second day's fight south of town, and the dramatic third day's fight that sealed the fate of Lee's best remaining men. After three days of fighting, the greatest battle in the Western Hemisphere produced 7,058 men dead on the fields and another 44,054 wounded or missing. Meade lost one-quarter of his army; Lee nearly 40 percent. Should you travel to Gettysburg on the Confederate route via Chambersburg and Cashtown, you can briefly see the town (Chambersburg) burned by Confederate Maj. Gen. Jubal Early on July 30, 1864, as retaliation for the Federal campaign in the Shenandoah Valley. In tiny Cashtown, 7 miles west of Gettysburg on US 30, you may see the Cashtown Inn, an historic structure that served as a headquarters for Confederate Lieut. Gen. A. P. Hill on July 1, 1863. Gettysburg offers so much to see that the best way to tour the park uses three loops, one covering the first day's field, Culp's Hill, and Cemetery Hill, the second covering the second day's field, the Round Tops, Devil's Den, the Wheatfield, the Angle, and the Confederate lines, and the final loop covering the town and National Cemetery. Once you reach Gettysburg, you may want to start at the Visitor Center, which contains a superb museum of Civil War artifacts. From the center of town, travel south on Baltimore Street, turn right on Steinwehr Avenue, and turn left on the Taneytown Road. In the museum you'll see relics such as chairs from the Gettysburg Address speaker's platform, the saddle Lincoln rode to the ceremony, the table on which Stonewall Jackson's arm was amputated, a field desk used by Robert E. Lee, Brig. Gen. John W. Geary's saddle, and uniforms belonging to generals Samuel W. Crawford, James J. Pettigrew, and Samuel K. Zook. An "electric map" uses lights to show how the battle unfolded. In the nearby Cyclorama Center, located just to the south, you can see the famous Gettysburg Cyclorama, a 356 foot by 26 foot circular painting depicting the battle, completed in 1884 by Paul Philippoteaux. Although the schedule for exhibition changes periodically, the Cyclorama Center frequently displays one of the five known copies of the Gettysburg Address, on loan from the Library of Congress. The museum will give you a great warm up for the park itself. Gettysburg offers so much to see that it's best to follow the routes in a specific manner, one that shows you the landscape in a reasonably chronologically relevant fashion. You may wish to start with the first day's field northwest of the town. From the Visitor Center, take Baltimore Street north until you reach Middle Street, where you should head west. After crossing Pitzer's Run, a tiny creek fought along on the first and second days, turn right (north) on Reynolds Avenue, which leads to McPherson's Ridge. Along this road you'll find many regimental monuments and, after crossing Meredith Avenue, you'll see on the left a small obelisk back in the woods. This is the John Fulton Reynolds Death Monument, marking the spot where the Federal I Corps commander, a Major General, was killed by a Minie bullet just after the battle began. Before reaching the Chambersburg Pike (US 30), you'll see the Abner Doubleday Monument and the Abner Doubleday Headquarters Monument on the right side of the road. Federal Maj. Gen. Doubleday took command of the I Corps when Reynolds died. Turn left on the Chambersburg Pike and you'll immediately pass the Edward McPherson Farm, site of early action in the battle. The barn served as a hospital following the battle. You may wish to travel 250 yards and pull off on the right side of the road. Here you'll see the John Buford Monument, recognizing the Union Brig. Gen. whose cavalry started the battle, and the John Fulton Reynolds Monument, an equestrian statue honoring the fallen corps commander. The Buford monument contains the cannon tube that fired the first artillery shot of the conflict. To enter McPherson's Woods, cross the Chambersburg Pike and enter Stone Avenue. Here you'll find many regimentals scattered along the McPherson property and a small pond called the Mathew B. Brady Pond. At this spot Brady took a famous photograph of himself after the battle. Nearby you'll see the John Burns Monument, a statue commemorating the local farmer who, in his seventies, took up arms and fought with the 7th Wisconsin Infantry against the Confederates during the battle. If you look across the road from the monument, toward the northwest, you'll see the fields that lead down to Willoughby's Run, a small creek where the first small arms shots of the battle rang out. Confederate troops marched across these fields toward Gettysburg and pushed the Union troops, lacking reinforcements, back into the town. Continue around on Meredith Avenue, turn left on Reynolds Avenue, and continue straight across the Chambersburg Pike. This will lead you to the northern part of the first day's field. Eternal Light Peace Memorial on Oak Ridge. During the first day Confederate artillery positioned here battered the retreating Union army, still waiting for reinforcements, and raised the possibility of a major Confederate victory. Seventy five years later, during the final large scale reunion of Civil War veterans, Gettysburg soldiers heard President Franklin D. Roosevelt dedicate the Peace Memorial to symbolize the reunited nation. Continuing on Buford Avenue and recrossing the Mummasburg Road will bring you to the Oak Ridge Observation Tower, which affords a good view of the first day's field and the town of Gettysburg. More regimentals stand along Doubleday Avenue. You may wish to continue along Robinson Avenue, a looping section of road that contains the John Cleveland Robinson Monument, a tribute to the Union Brig. Gen. who held the Confederates at bay for four hours on Oak Ridge. To continue with the first day's field, turn right on the Mummasburg Road, travel 500 yards, and turn left on Howard Avenue. Here you'll see the 1st Ohio Battery Monument, cross the Carlisle Road (SR 34), and reach the Old Almshouse Cemetery, a local burying ground. Just beyond this stands Barlow's Knoll and the Francis Channing Barlow Monument, where the young Brig. Gen. was severely wounded and left on the field for dead. After seeing Barlow's Knoll you may wish to turn south (right) on the Harrisburg Road (Business US 15) and return to town, or you may turn north and proceed 200 yards to Jones Battalion Avenue, which contains a few monuments. Back in town, follow the Harrisburg Road until it reaches Lincoln Avenue, where you should turn right. You may want to turn left on Stratton Street and stop when you reach Coster Avenue, a walking path on which you can see the 154th New York Infantry Monument and the Jacob Kuhn Brickyard Site. Here Union infantry held Confederate attacks from the north that eventually pushed the Yankees south through the town. During most of the Gettysburg battle Robert E. Lee lacked his cavalry under Maj. Gen. James E. B. "Jeb" Stuart, a force that rode around the Union army and captured trains and supplies. When Stuart did arrive on July 3 Union cavalry under Maj. Gen. Alfred Pleasonton intercepted him and fought a cavalry battle east of the main battlefield. To see the cavalry site, you should travel east on the Hanover Road (SR 116). From Coster Avenue, head south on Stratton Street and turn left on the Hanover Road. Along the way you can see the Richard Stoddert Ewell Headquarters Monument on the left side of the road at Sixth Street - Confederate headquarters of Ewell's Corps - and Benner's Hill (on your right a mile from Stratton Street), a Confederate artillery perch during the final two-thirds of the battle. Continue slightly more than 2 miles beyond Benner's Hill and you can turn north (left) into East Cavalry Avenue. Continue north on Low Dutch Road, turn west (left) on Gregg Avenue, continue north on Confederate Cavalry Avenue, and you'll find yourself in the middle of the East Cavalry Battlefield Site, where you'll see several regimental monuments. To return to the main battlefield tour, continue northwest on Cavalry Field Road and turn west (left) on the York Pike, which will bring you back into town. Continue on York Street until you reach Liberty Street, where you should turn south (left). Continue along as this becomes East Confederate Avenue. You're now approaching Culp's Hill, a major area of battle on July 2, when Confederate troops unsuccessfully attacked the Union regiments holding its crest. Savage fighting ensued around the base of this hill throughout the second and third days, producing large numbers of casualties. When you reach Slocum Avenue, you may wish to turn north (right). This will carry you past many regimental monuments and on to the summit of Culp's Hill. On the way you'll see the John White Geary Monument, which honors the Federal Brig. Gen. who helped hold the hill. At the summit you'll find the Culp's Hill Observation Tower, which provides a superb view of the battlefield and the countryside surrounding it. Nearby stands the George Sears Greene Monument, honoring the Brig. Gen. whose troops held the highest ground on the hill. Continue west on Slocum Avenue and you'll find the Henry Warner Slocum Monument, an equestrian statue immortalizing the Union XII Corps commander. You've now finished the first circuit through Culp's Hill, and you may wish to turn south on the Baltimore Pike (SR 97) to see the rest of Culp's Hill. To do so, head south on the Baltimore Pike 3/4 of a mile and turn east (left) on Spangler Road. (Halfway to the turn you'll pass the Henry Spangler Farm Site on the left side of the road). On Spangler Road you'll see several regimentals. When you reach a loop, bear east (right) on Carman Avenue. You'll see the 13th New Jersey Infantry Monument. Turn south (left) on Spangler Road and you'll see the 2nd Massachusetts Infantry Monument and the 3rd Wisconsin Infantry Monument. Turn east (left) on Carman Avenue and you'll cover the loop again, a necessity due to the one way roads. This time, however, continue north on Colgrove Avenue. This leads you to a significant battle area, Spangler's Meadow, where you'll see the Indiana Monument. Although they were turned back at Culp's Hill, Confederate troops seized this area on July 2 and held it until the next morning. Across from the meadow you'll see Spangler's Spring, at the time of the battle a valuable source of water where thirsty wounded troops from both sides shared precious water. Continuing along and turning west (left) on Geary Avenue will bring you to Pardee Field, where Lieut. Col. Ario Pardee, Jr., led his 147th Pennsylvania Infantry in an attack that defied orders but captured a stone wall that served as an effective fortification. The wall is still visible along the tree line on the northern edge of Pardee Field. Continuing north on Williams Avenue and on Slocum Avenue will again bring you to the Baltimore Pike, where this time you may wish to turn north. You're now on Cemetery Hill, one of the most crucial spots on the Gettysburg battlefield. Here on the afternoon and evening of the first day Union troops held the high ground and prevented the Confederates from pushing them south of town. On the crest of Cemetery Hill you'll see a large group of monuments, which includes the Winfield Scott Hancock Monument and the Oliver Otis Howard Monument, both equestrian statues, and the Oliver Otis Howard Headquarters Monument. Maj. Gen. Hancock arrived on the field late in the first day and assumed overall command, assigned to him by Meade (who was traveling toward Gettysburg but still away from the field). Maj. Gen. Howard, commanding the XI Corps, ranked Hancock and did not appreciate serving under his subordinate. After arguing on the hill where you're standing, the two agreed that Hancock, ordered to do so by Meade, should assume command. The artillery batteries on the crest marked by monuments staved off vicious Confederate attacks from the town and points east. Across the pike stands the Evergreen Cemetery Gatehouse, a prominent landmark that was substantially damaged during the battle. Ironically, a sign within the local cemetery proclaimed that anyone using firearms within the cemetery grounds would be prosecuted to the full extent of the law. Within Evergreen Cemetery you can see the graves of many local residents whose names are associated with Gettysburg landmarks, including the town's founder James Gettys. You'll also find the Mary Virginia "Jennie" Wade Grave, marking the burial spot of the 20-year-old single civilian casualty of the battle, and the John Burns Grave, the resting place of the spirited resident who fought with the 7th Wisconsin. You can also find the grave of Bvt. Lieut. Col. Emmor B. Cope, who after the war contributed much to the mapping and planning of the Gettysburg park. When you're finished in Evergreen you may wish to travel north on Baltimore Street, turn south on Steinwehr Avenue, and proceed south on the Taneytown Road to return to the Visitor Center. You've now completed the first of the three Gettysburg battlefield loops. The second loop begins at the Visitor Center and takes you north on the Taneytown Road, which becomes Washington Street, to Chambersburg Street, where you should turn west (left). At the corner of Chambersburg and West streets you'll pass the John Burns Home Site. Continuing west takes you past the Shead House and to the Mary Thompson House on the Chambersburg Pike. Preserved in superb condition, the Thompson house is now a museum filled with Gettysburg relics. Across the pike from this house you'll see the General Headquarters, Army of Northern Virginia Monument, where General Lee and his staff set up tents and directed the Confederate part of the battle. From the Thompson House, you may wish to travel south on Confederate Avenue (Seminary Avenue) to see the Lutheran Theological Seminary, a prosperous academy during Civil War days. The central building in the campus is Samuel Simon Schmucker Hall. Before the battle erupted Maj. Gen. John F. Reynolds and Brig. Gen. John Buford climbed into the cupola of this building and watched the approaching Confederates through field glasses. Continuing south on Confederate Avenue you'll cross the Hagerstown Road and see on the southeast corner of the intersection the Shultz House, another wartime structure. By traveling south on West Confederate Avenue you'll be tracing Seminary Ridge, the position of the Confederate lines of battle, particularly as they formed for the massive attack known as Pickett's Charge that occurred on the third day. After 1/2 mile you'll see the McMillan Farm on the left side of the road, and you're now entering the McMillan Woods. Another 400 yards will bring you to the North Carolina Monument, which marks the northern position from which Pickett's Charge commenced. Some 350 yards south of this position you'll find the Tennessee Monument left of the road and the Ambrose Powell Hill Headquarters Monument on the right side. Continuing another 400 yards will bring you to the Robert Edward Lee Virginia Monument, which marks the center of the Confederate lines and the position from which Lee planned Pickett's Charge. The superb equestrian statue of one of the best of Lee in existence. South of the Lee monument you'll move into the Spangler Woods, cross Pitzer's Run, and see the Florida Monument on the right of the road. Across the road from this monument is the M. Spangler Farm Site. Nearly 400 yards south of this spot, where the road bends due south, you may wish to turn west (right) into Berdan Avenue, where you'll see the 1st United States Sharpshooters Monument. In this area Col. Hiram Berdan led his elite regiment into a skirmish with Confederates on the second day. Continuing south on West Confederate Avenue will carry you into the Pitzer Woods and along the spine of Warfield Ridge. You'll see the Louisiana Monument, the Mississippi Monument, and cross the Waterworks Road (Millertown Road). After crossing the road you can climb the Warfield Ridge Observation Tower to get a fine view of the southern part of the field. Across the road from this tower stands the James Longstreet Headquarters Monument, where this Confederate Lieut. Gen. concentrated his forces. To the south you'll find the Georgia Monument, the South Carolina Monument, and the Arkansas Monument just before crossing the Emmitsburg Road. North of this intersection is the P. Snyder Farm Site. Crossing and continuing on South Confederate Avenue brings you to the Texas Monument, the Alabama Monument, and the Confederate Soldiers and Sailors Monument. From this position you can see to the northeast the J. Slyder Farm, known as the "Granite Farm." Beyond this structure you can see the strategically important hills that held the key to success at Gettysburg. As South Confederate Avenue winds east and becomes Kilpatrick Avenue and then Sykes Avenue, you'll encounter the William Wells Monument, honoring the Union Major who led the 1st Vermont Cavalry on a charge against the Confederate line. When you cross Rose Run you're now at the base of the largest hill in the area, Round Top. Union and Confederate troops scrambled up Round Top on the second day only to find it useless for military purposes because the summit was too heavily wooded to use for artillery. The strategic focus, then, fell on Little Round Top, a smaller hill north of Round Top with a ragged, rocky ridge along its summit that would command the battlefield when equipped with big guns. On July 2 during the crucial moments of the battle, Union regiments seized control of Little Round Top and fought back repeated assaults from Confederate attackers. You may want to continue until you reach Wright Avenue and then turn east (right), which after 50 yards brings you to the 20th Maine Infantry Monument in the hollow between Round Top and Little Round Top. The stone wall running north from this monument marks the site where the 20th Maine, led by its Col. Joshua Lawrence Chamberlain, held the critical ground here. After running out of ammunition, the regiment fixed bayonets and charged, an action for which Chamberlain was awarded the Medal of Honor. Reversing direction on Wright Avenue, you'll cross Sykes Avenue and travel northwest on Warren Avenue, gaining an excellent view of the face of Little Round Top to the north. In the woods after crossing Sykes Avenue you can see the 83rd Pennsylvania Infantry Monument, a statute of Brig. Gen. Strong Vincent, mortally wounded here on July 2. As you reach the base of Little Round Top you'll cross Plum Run and then turn south into the Devil's Den. 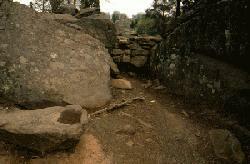 Here Confederate sharpshooters hid in the rocks and fired at Union troops on Little Round Top. A brisk battle between Devil's Den and Little Round Top flared throughout the second and third days of the engagement, making the valley between the features an enormous shooting gallery. The tremendous casualties piled up in the valley gave it the name the Valley of Death. An area of particularly savage fighting at the base of the Devil's Den, now an overgrown pool through which Plum Run trickles, is the Slaughter Pen. Numerous images of dead were produced several days after the battle in and around the Devil's Den, Slaughter Pen, and Valley of Death. The most famous of these shows a dead Confederate sharpshooter at a rock formation still visible on the western side of Devil's Den. The photograph, made by Alexander Gardner, was contrived, the body moved from its original site. As you travel north on Sickles Avenue you'll pass through Houck's Ridge, see several regimental monuments, and come out of the woods at another savagely bloody field of battle, the Wheatfield. This area witnessed numerous attacks by both sides on the second day when Union and Confederate regiments took, lost, and retook the field time and time again. In the end nothing came of theWheatfield fight excepting hundreds of casualties. In the center of the field you can now see several regimental monuments. As the road loops west and then north, the ground to the west is Stony Hill. After traveling 200 yards you'll reach Wheatfield Road, where you should turn west (left). After 600 yards you'll reach an enclosed square grove of trees on the left side of the road. This is the Peach Orchard a part of the John L. Sherfy Farm, which lies across the Emmitsburg Road. On the second day Federal Maj. Gen. Daniel E. Sickles marched his III Corps out from the base of Little Round Top across the Wheatfield and up to the Peach Orchard, exposing his corps to enfilading fire from the Confederate lines and a massive attack from Longstreet's corps. He did so against orders and nearly created a Union disaster in the process. Sickles was hit grievously in the leg (and subsequently lost it), shouting orders and chewing a cigar as he was carried off the field. Across the Wheatfield Road from the Orchard, at the junction with the Emmitsburg Road, is the Wentz Farm Ruin. You can loop around the Peach Orchard by turning south (left) on the Emmitsburg Road, turning west (left) on Birney Avenue, turning east (right) on the Wheatfield Road, and proceeding north (left) on Sickles Avenue. This will take you past several regimental monuments, including the Excelsior Brigade Monument. By turning west (left) on United States Avenue and then heading south (left) on the Emmitsburg Road, you can get a close look at the Sherfy Farm. Next, you may wish to head east (left) on the Wheatfield Road and pass the northern edge of the Wheatfield. On this side you'll see the Samuel Kosciuszko Zook Monument, where this Union Brig. Gen. was mortally wounded on July 2, dying shortly after midnight the next day. Continuing on, head south (right) on Ayres Avenue and you'll see several regimentals relating to the Wheatfield fight. The road becomes Cross Avenue which in turn becomes Brooke Avenue when you cross Rose Run and pass the J. Timber Farm Site left of the road. Now you're entering the Rose Woods, where numerous Confederate casualties piled up on the second day. As the road again crosses Rose Run, the G.W. Rose Farm lies 100 yards west of you. The road now becomes De Trobriand Avenue and contains many regimental monuments. Continue along Sickles Avenue until you reach the Wheatfield Road, where you should head east (right). You can now drive through the center of the Valley of Death by turning south (right) on Crawford Avenue. Just before that turn, after crossing Plum Run, note the John T. Weikert Farm Site to the left. On Crawford Avenue you'll find the Samuel Wylie Crawford Monument (the plaque misspells his name), which honors the Union Brig. Gen. who commanded the Pennsylvania Reserve Corps, part of the V Corps which fought through the Valley of Death. As you reach the base of Little Round Top, head east (left) on Warren Avenue and then turn north (left) on Sykes Avenue. This leads you to the summit of Little Round Top, the crucial strategic position of the battle. At the time of the battle, the craggy face of Little Round Top had recently been cleared of timber. Here you can see several important monuments marking the Union's hold on Little Round Top. 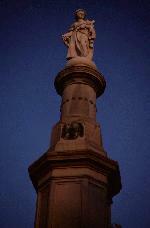 The most prominent is the Gouverneur Kemble Warren Monument, a bronze statue of Meade's chief engineer. Maj. Gen. Warren recognized the importance of taking and holding Little Round Top and his special efforts to ensure the position made him a hero of Gettysburg. Near the Warren monument you'll find the 155th Pennsylvania Infantry Monument, the 91st Pennsylvania Infantry Monument, the 140th New York Infantry (Patrick Henry O'Rorke) Monument, and the 44th and 12th New York Infantry Monument. North of these regimentals, slightly downhill from the crest, you'll find the 121st New York Infantry Monument, a statue of Col. Emory Upton. Nearby stands the Stephen Hinsdale Weed Monument, honoring the young artillerist who was mortally wounded and died on July 2. If you travel north on Sykes Avenue you'll cross the Wheatfield Road and continue on Sedgwick Avenue, where you'll see the John Sedgwick Monument, an equestrian statue memorializing the commander of the Federal VI Corps. About 100 yards north of this you'll see the George Sykes Headquarters Monument, marking the position of Sykes' headquarters of the Federal V Corps. Slightly farther north and across the road stands the John Sedgwick Headquarters Monument, site of the Union VI Corps headquarters. Just north of this monument you'll enter the wartime Patterson Woods, and after traveling 500 yards you'll see the George Weikert Farm at the junction with United States Avenue. As you continue north on Hancock Avenue you'll encounter the William Corby Monument (Corby was Chaplain of the Irish Brigade) and the New York Auxiliary Monument on the right of the road. Where the road forks, bear right on Humphreys Avenue. You may wish to turn east (right) on Pleasonton Avenue. At the junction of Humphreys and Pleasonton stands the massive Pennsylvania Monument, the largest and most elaborate structure on the field. The tablets fastened to the monument's marble walls record the names of the more than 30,000 soldiers from Pennsylvania who fought at Gettysburg. Across Pleasonton Avenue you'll see the Winfield Scott Hancock Headquarters Monument, marking the location of the II Corps headquarters. Hancock, who seized control of the battle early on, was on the third day badly wounded near his headquarters site. Following east on Pleasonton Avenue takes you past the J. Hummelbaugh Farm, the house in which Confederate Brig. Gen. Lewis A. Armistead died, having been mortally wounded in Pickett's Charge. Damage from small arms fire is still visible on the clapboards of this house. Across the road you'll see the John Newton Headquarters Monument, marking the position of the Federal I Corps after Newton assumed command from Abner Doubleday. To continue the tour, you may wish to turn north (left) on the Taneytown Road. After traveling 150 yards you'll pass the Peter Frey Farm on the left of the road. Another 400 yards takes you to the Henry Jackson Hunt Headquarters Monument, which marks the headquarters site of the commander of the Federal artillery for the Army of the Potomac. Hunt's artillery barrage on the third day wrecked any chance for the success of Pickett's Charge. Just beyond this monument, on the left side of the road, is an important wartime structure. (You may have to park on Hunt Avenue, across the Taneytown Road, to explore it.) The Lydia A. Leister House served as Maj. Gen. George G. Meade's headquarters during the battle, and in this house Meade held a crucial council of war on the night of July 2, deciding to stay and fight on the third day. Next to the house you'll see the General Headquarters, Army of the Potomac Monument. Around this house the Union high command operated the battle that would signal the beginning of the end for the Confederacy. You may wish to continue north on the Taneytown Road, turning west (left) into Ziegler's Grove Drive, north of the Visitor Center. This will take you on the final, closing loop of the main park roads, to the scene of the final, climactic action at Gettysburg. As you enter Ziegler's Grove you'll wind southward past the Alexander Hays Monument, honoring the Union Brig. Gen. whose division held the line in Ziegler's Grove against Pickett's Charge. Turning south (left) on Steinwehr Avenue will take you past the Grand Army of the Republic Monument, paying tribute to the GAR and its last bonafide combat survivor, Albert Woolson, who died in 1956. The stretch of Steinwehr Avenue you are now on, which becomes the Emmitsburg Road, will take you through the center of the Pickett's Charge field. The attack, planned by Generals Lee, Pickett, and Pettigrew, was a desperate attempt to send 15,000 Rebel troops punching through the Union center, routing the Federal army and sending it retreating in confusion. Just after noon on the third day Confederate artillery along West Confederate Avenue, some 170 guns, opened up on the Union lines on Hancock Avenue. 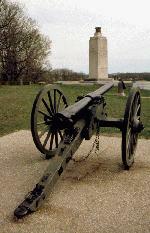 Soon the 175 Union artillery pieces placed from Cemetery Hill in the north to Little Round Top in the south, but concentrated along Hancock Avenue, responded. The greatest artillery duel up to that time ensued. After 90 minutes the guns fell silent. Most of the Confederate shells sailed high over their targets, and the Union gunners stopped in peculiar spurts, mimicking an exhaustion of ammunition. Lee took the bait and launched the famous charge, most of the 15,000 men being cut to pieces by an explosive renewal of Federal gunnery that hit the oncoming Confederates from three sides. From the GAR monument, travel south on the Emmitsburg Road for 700 yards until you reach the Simon J. Codori Farm on the left side of the road. You're now near the center of the Pickett's Charge field. Continuing another 400 yards takes you to the Rogers Farm Site, where you should bear left onto Sickles Avenue, past the D. F. Klingle Farm. When you reach United States Avenue, you may wish to turn east (left) to see the Daniel Edgar Sickles Headquarters Monument, the site where Sickles established the III Corps position in his endangered salient. Just beyond that marker, on the north side of the road, stands the Abraham Trostle Farm, a prominent battlefield landmark. Artillery damage is visible in the brick portions of the Trostle Barn, west of the clapboard farmhouse. You may wish to proceed across Plum Run, continue to Hancock Avenue, and turn north (left). This will take you to the climactic ground at Gettysburg, the receiving end of Pickett's Charge. Continue north on Hancock Avenue past the Pennsylvania Monument, beyond which you'll see the Vermont Monument, which incorporates a statue of Col. Lewis Addison Grant. The nearby 13th Vermont Infantry Monument features Brig. Gen. George Jerrison Stannard. Numerous monuments are scattered between the Vermont markers and the Visitor Center, most of which indicate the positions of Federal regiments that met Pickett's Charge. The United States Regulars Monument, a huge obelisk, stands 100 yards to the north. Across the road the John Gibbon Monument honors the Union Brig. Gen. who assumed command of the II Corps when Hancock was wounded. The most significant symbolic monument at Gettysburg can be found 150 yards north of the Gibbon Monument. Placed in the Copse of Trees, a stand of oak trees that Lee used as his mark for the Union center, the High Water Mark Monument commemorates the commands that took part in Pickett's Charge, on both sides of the fence. The monument's tablet and cannon symbolize the high water mark of the Confederate war effort. Just north of this monument you'll find The Angle, the spot where the low stone wall running along this part of the line makes a 90 degree bend. Here the relatively few Confederates who made it to the Union line engaged in hand-to-hand combat with the Union defenders. You'll see in this area several important monuments. The Lewis Addison Armistead Monument marks the position where the Confederate Brig. Gen. fell mortally wounded. The Alonzo Hersford Cushing Monument memorializes the young Wisconsin artillerist who fell dead after firing one last shot from his battery. 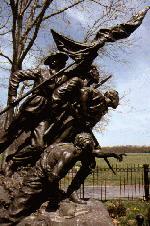 The 72nd Pennsylvania Monument illustrates the brutal nature of the Pickett's Charge fight. The Alexander Stuart Webb Monument honors the Union Brig. Gen. who staunchly defended the center of the Union line. On the eastern side of Hancock Avenue you'll see the George Gordon Meade Monument, a magnificent equestrian statue celebrating the Federal commander. Farther north, west of the Cyclorama Center, you'll see the Abram Bryan Farm, the reconstructed house of a free black who lived on these grounds at the time of the battle. You've now seen the major features of the park and you may wish to return to the Visitor Center. To see the third and final loop of Gettysburg landmarks, begin again at the Visitor Center. From there, you can head north on the Taneytown Road, turn right on Steinwehr Avenue, and turn north (left) on Baltimore Street. On the southeast corner of Baltimore and High Streets you'll see the Gettysburg Presbyterian Church, where Abraham Lincoln attended services during his November trip from Washington to deliver the Gettysburg Address.Heading east on High Street you'll come to the Gettysburg City Offices Building, a structure that was the Adams County Jail at the time of the battle. Across the street is the Gettysburg Public School Building, another wartime structure. Turning north (left) on Stratton Street carries you past the Trinity United Church of Christ, the German Reformed Church during Civil War days. Crossing the railroad tracks and turning west (left) on Water Street, then south (left) on Carlisle Street, leads to the Gettysburg Visitor Center, the wartime railroad station where Lincoln first saw Gettysburg. Continue south on Carlisle Street and you'll come to Lincoln Square, the town center, where you may wish to see several buildings. The David Wills Building stands on the southeast corner of the square. Lincoln stayed with Wills on his Gettysburg journey and made a brief public appearance from the second floor. The building now houses a museum relating to Lincoln's stay and to Wills, a lawyer whose energy helped start the Soldier's National Cemetery. If you travel south on Baltimore Street a distance of 1/2 mile, you'll see on the right of the road the McClellan House, known as the Jennie Wade House. Here young Wade was fatally hit by gunfire while baking bread. Continuing south on the Baltimore Pike 200 yards brings you to the Gettysburg National Cemetery, the final stop on your Gettysburg tour. Known originally as the Soldier's National Cemetery, the 20.6-acre plot contains 3,629 graves of Civil War dead. The prominent landmarks within the cemetery, established after Abraham Lincoln's dedicatory remarks on November 19, 1863, are worth exploring. The first is the John Fulton Reynolds Monument, a bronze statue honoring the fallen Federal I Corps commander. Farther inside the grounds you'll see the New York Monument, a tall obelisk, and the Soldier's National Monument, an elaborate obelisk built in 1869 to commemorate the Gettysburg Address. Although this shaft ostensibly is supposed to mark the spot on which Lincoln delivered the great, brief, speech, research shows that the actual location was probably across the iron fence inside Evergreen Cemetery, on or near the Brown family vault, which was erected in the 1950s. Inside the circular rows of recessed headstones you'll see the Charles Henry Tuckey Collis Grave, burial site of a prominent Bvt. Brig. Gen. and Gettysburg resident. Inside the grounds you'll also encounter the Kentucky Monument and the Lincoln Gettysburg Address Memorial. 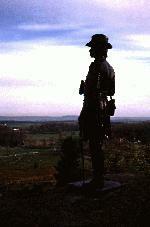 Having seen the major features of the battlefield of Gettysburg, you are an experienced Civil War battlefield buff. The vast outlay of real estate involved in the Gettysburg battle and incredibly detailed and extensive memorialization here make it by far the greatest of the Civil War battlefields. The monuments here will ensure that the significance of Gettysburg lives on long after our living are gone, as they have over the past century plus since the days of the war itself.